Steve Frew has served as an assistant coach at Rollins College (NCAA Division II, Winter Park, FL) since 1996. Currently, he serves as the pitching coach and also works with hitting instruction, scouting, and recruiting. 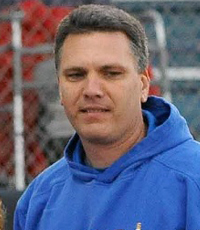 Prior to Rollins, he served as an assistant at Edison Community College (Ft. Myers, FL) for four seasons. All of his years have been in support of the same head coach, Michelle Frew. Together they have built a nationally-recognized softball program at Rollins. Rollins softball is a premier softball program in the country winning four of the last six Sunshine State Conference Championships since 2009, averaging 40+ wins since 2004, and having been ranked in the NFCA national top 25 poll every year for a decade. Since 2007, the Tars have been to the NCAA Tournament every year but one. From 2007-2014, Rollins players have earned 16 All-Americans awards, two NFCA Diamond Catcher of the Year awards (Top NCAA Catcher), and 57 regional awards. Additionally, from 2009 through the 2014 seasons, the Tars have never had fewer than six players named to the Sunshine State “All Conference” team (including as many as eight in 2011 and in 2014). Frew has conducted individual lessons and has served as the assistant director of Rollins and Michelle Frew’s summer fastpitch camps and clinics for almost two decades. He has the ability to connect and build positive relationships with players leading to success on and off the softball field. Steve earned a bachelor’s degree from Eckerd College in 1988. He received a master’s degree from Slippery Rock University in 1991 and a doctoral degree in higher education from Nova Southeastern in 2001. Steve and Michelle have two children, Erin Elizabeth and Dylan Hunter who both enjoy playing softball and baseball. In addition to coaching, Steve works with Riptide Software and also serves as a faculty member with the University of Phoenix where he facilitates graduate level research classes in education. Having been around the since she was an infant, our daughter showed signs of being interested in pitching at an early age. She started modeling the college girls and when she started playing organized ball, she wanted to get better. As parents, we wanted to find a coach for her. . . We wanted her to learn from more than just her parents. We tried different coaches in the area but never felt that there was a “right” fit for her. With more experience with established, college players, we knew that certain skill sets made pitchers successful. However, as I worked with our daughter, I did not connect with some of the traditional ideas and drills such as wrist snaps and t-drills. When we came across the Tincher program online, we really liked the idea of fluid dynamics and the physics behind it. When we learned that Angela was living in our community and area giving lessons, we sought her out. Our daughter immediately connected with Angela, and while catching for her, I connected with her too. Certain “darker” areas of pitching mechanics were becoming clearer, and not only did my daughter improve, my own coaching skills did as well. Our daughter became smoother and her speed continues to improve. I was able to add several techniques to my “tool belt”. Angela may not be here in Orlando anymore, but the time she gave to our family sparked my relationship with Denny. I began working (and learning) with him at different conventions and clinics up and down the East coast. Wow! What a wealth of scientifically-backed information! The Tincher pitching model and the philosophy related to fluid dynamics are strong and sound. Steve is very experienced, analytical, and dedicated to the sport. The very first time he met with our Instructor group, he quickly gained a level of trust and respect that made people want to hear the things he had to say. Steve has that unique ability to break big problems down into easily manageable parts. It makes kids feel no issue is too difficult and no goal is too high. We are excited to have him representing us in Florida.